CAN STREET PEOPLE NPOs COLLABORATE TO LINK COMPASSIONATE BUSINESS OUTREACH SERVICES TO STREET PEOPLE TOO? Whilst Shoprite and most diosadvatged community outreaches sponsored by business are not yet specific to People living on the street, Street People NPOs Will be stronger when we form alliances with each other as an inclusive body and business visionarly initiatives . If we collaborate as a united body we can access and draw attention to business sponsored relief effort like Shoprite Outreach but for Street people which would be a first. 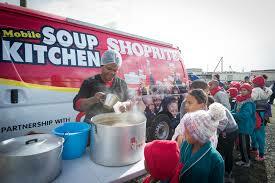 When Amid the severe Cape Storm in June 2017, Shoprite’s Mobile Soup Kitchen served residents of Wesbank, outside Cape Town, a warm cup of soup. Greenlands Primary School in Bishop Lavis, Cape Town and the Wathint’ Abafazi crèche in Bethelsdorp, Eastern Cape, are just two of the numerous sustainable projects that have already stemmed from the Mobile Soup Kitchen initiative. In addition to supplying daily feeding programmes with fresh produce, the gardens also help with fundraising and skills transfers whilst the Shoprite stores in these areas take ownership of the community projects so that they continue to thrive. To close the loop, many of these organisations also have access to the retailer’s Surplus Food Programme. In the last financial year alone, the Shoprite Group made R108 million of surplus food available to hundreds of verified non-profit organisations for distribution to thousands of people every day. 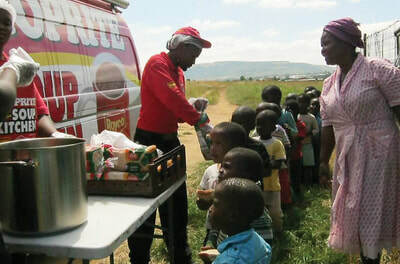 What is today an extensive hunger relief programme all started with the Group’s Mobile Soup Kitchens a decade ago, and the communities served by Africa’s largest food retailer will continue to be at the heart of its ongoing efforts to tackle hunger.